My spiritual dad Dr. Fred Price always says, “How do you think you can obey God’s law, if you don’t obey the laws of the land”. That seemed to always apply when it came to driving for me, and I’m sure you can relate. Off I go to run some much needed errands. Which way will I go and what errand will I tackle first? Got it! Go down Brandywine Road to Branch Avenue to head out to Waldorf. Just remember when you go pass the two school zones to slow down because you have received a ticket before. Don’t judge me! Lol! First school; I slowed down. Second school; I slowed down. I found myself in the school zone behind a long line of cars. They were driving extremely slow because for two years or longer a camera had been placed by both schools to ticket those of us who disobeyed the law. Well after driving by the same camera for two years I was trained along with others to slow down. Cautiously mimicking the speed of the cars in front of me, I noticed something very different about the spot that housed the camera this day. It was gone! I looked all around in disbelief first because I was so accustomed to seeing it there. I wondered if anyone else noticed that the camera had been hauled off, and if so why are they still going slow? My first thought was, “Oh, I get to relax and drive!”. Holy Spirit began to speak, “The camera is not there, but see it.”. The absence of that camera did not permit me to do as I pleased. The restraint that I felt when I saw the camera day after day was the restraint that I needed to maintain in my mind to make sure I didn’t get another ticket! Lol! we forfeit the benefits of grace and righteousness by choosing to do our own thing. What do you do when no one’s looking? What happens when you know you won’t get caught? 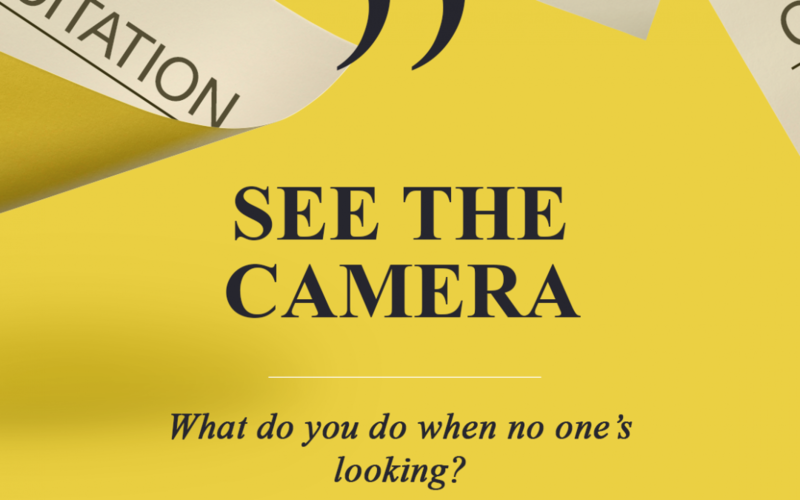 What do you do when you don’t see the camera? How much more if you’re insensitive to doing what’s right with these things will you become insensitive to the things of God. Think about the times you missed a church service here and a church service there. Soon enough one service became three services, and then a month. Slowly you begin to see yourself comfortable with less restraints doing things your way and the conviction of Holy Spirit begins to become faint. So many of the people of God believe that grace is a pass to do as they desire at the expense of righteousness. Jesus did not come to do away with the law but to perfect it. We may not have the same penalties being under grace, but we forfeit the benefits of grace and righteousness by choosing to do our own thing. Grace give us the ability to “offer ourselves to the ways of God” with ease. In my last blog “The Night Before“, Coni commented (I so enjoy reading your comments :-)) and said, “Thank you for marching for the cause!!! This means so much and we are accountable to each other to raise awareness in spite of our circumstances! You are our champion Dr. Dee Dee!”. Reading comments like these I am reminded of the responsibility to continue to champion in doing what’s right! And I share that same responsibility with you Beautiful. Let’s avoid the traffic tickets, the accidents, and the other expenses that occur when you don’t follow the rules. Don’t frustrate the grace of God by not seeing the cameras. Our Father is counting on us. Let’s commit to keeping our hearts pliable to the conviction of Holy Spirit and adhere to doing what’s right. I love you! Thanks!! It’s always good to check yourself daily!! God is with us and sees all we do!! Love it!! Thank you Dr. Dee Dee for continuing to sow in our lives. Thank You…. A woman of passion to see other lives change. Your weekly blogs are the best learner tools to start the week off right. Ouch and Amen! Love the nuggets for my soul. Thank you so Much Dr. Dee Dee I so needed to read this blog Right Here! Yes Ma’am, this is a Good Word! Pushing me towards excellence. I love reading your blogs and I look forward to each of them. You have an awesome way of teaching others the Word through your own experiences and I admire and take heed. Thank you again for sharing. Your blogs are a blessing to me, you are an awesome teacher in using your life experiences to bring forth the word. I look forward each week ro see what the Lord has given you. Great article…doing the right think when nobody is looking.. Awesome word Dr. Dee. When you don’t follow the law and do things your own way the consequences can be devastating. Wow! You always have to be watchful because you never know when you are being watched,so be ready at at all times, because somebody is going to follow your lead. I can absolutely relate. I just rec’d in the mail an envelop from the DC Police Dept. It was a picture of my car, a close up of my tags. Yep, it was me; it was my car. I was looking at a $100 ticket for doing 38 in a 25 mile/hour zone. I didn’t see the camera. I didn’t see the warning. And now I have to pay the penalty. As it is in the natural so it is in the spirit. Holy Spirit sends us signs, warnings & a “camera” that cautions us to pay attention; to be alert, awake & aware. When we don’t heed the warning to slow down, we pay the price. Thank you Dr. Dee Dee for using such a practical application we can all relate to. I appreciate your blogs & the simplicity of the WORD! Good lesson today as always!!! Thank You Dr. Dee Dee! Well fed! Thank you Pastor Dee Dee!! This was a good reminder…just do the right thing! Excellent! It’s something Holy Spirit calls me on time to time. Just when you think you are doing good, “The Holy Spirit”, comes to remind you about the Panorama view, “Got You”. Thanks again Dr. Dee Dee for keeping me on my toes, You are blessing thank you. Dr Dee Dee, thanking you again for such a powerful message. In the words of one of my favorite aunts “if you can’t hide it from GOD, you can’t hide it from know one.” We surely can’t hide anything from him. I see the camera.📸 Willing to do what’s right. I just joined this blog. I know it’s a blog, yet I sense both Holy Spirit and Dr. DeeDee are talking just to ME! Heart You! Thank you for a powerful message and helping us to be held accountable for our actions, seen and unseen. Thank you Dr. DeeDee for your encouraging words to remind us that we are always being watched and that we as believers should always want to pease our heavenly Father by purposing in our hearts to do what is right even when we think no one else is watching! May God continue to shower you and your ministry with His choicest blessings! This is a very good reminder of measuring our true character. What am I doing when no one is looking? lol Do I put the shopping cart back in the right spot, or take the unwanted item allll the way back to its proper place. Lord, I try. Thanks Dr. Dee Dee. As always, this was an amazing message and I thank you for your transparency. I look forward to reading the next blog. Have an amazing rest of the day! WOW!!! Boy did I need this blog. I have been running the stop signs on campus recently saying to myself the campus police aren’t around so keep going. How said is that? Thank you for the reminder that regardless the cameras are there, and I MUST change. Wonderful read…. this really hit home for me; honored to follow your life. This is an awesome word about integrity. What are we doing when no one is looking. I really enjoy your blogs! I usually think of things in terms of attitudes surrounding being convicted of sins that others can see, or feel from our actions – but tonight apply this to think about the grace that covers me when I am just complacent in being responsible about the self-work I do physically that seemingly only impacts ME. A ticket, not exercising, being lazy about flossing, not keeping promises to myself, emotional awareness, whatever those things between you and God that no one would even know to hold you accountable for are. Until reading tonight's entry, I mostly applied this in the role that others see, and not the small things that are seemingly unimportant in the big picture because I am the only one impacted by it. But – everything matters in a connected body of Christ. My realization is that when I shortchange myself even in being self-disciplined and self-accountable when no one else is for things that only I see, I risk full functionality in my purpose, and that puts the whole body at risk for God's purpose. Sure, we always win, we can't work into righteousness, grace is sufficient – but that doesn't mean that work isn't required, consistently and we aren't accountable to give our best and get's God's best, and build the aggregate vision for His kingdom. Wow Pastor thid is righ on point. I know I was laying down & I heard the Holy Spirit say always be attentive to Me in doing whats right & not whats best. We do forget that God knows our thoughts. He made us. He designed us for His Will & we are forgetting that. Excellent word and perhaps too big of a bite for me…it’s rare that I follow the speed limit law. :-) Now that you’ve brought this to my attention, I’ll seek God’s wisdom on other things I’m neglecting to obey/follow and see. Thanks, so appreciate your heart. I read this before and found my reading it again today what an Uh Huh moment. Accountability, nothing is hidden under the “SON”. Thank You for awaking the reality in me. Hi Pastor! Just catching up on the blogs I’ve missed, and they were spiritually fulfilling! The grace topic always comes up when talking to believers and this article just gave me an even better way to articulate the topic of grace! Awesomeness in one place! Love you to God! Years ago Dr. Mike encouraged us to do the right thing and to know the right thing to do. This is what my definition of righteousness became and continues to be after many years. It reminds me constantly that I must be obedient to Gods word forever. Your sharing this time as in many of your writings affirms this conviction Dr. DeeDee. Thank you!